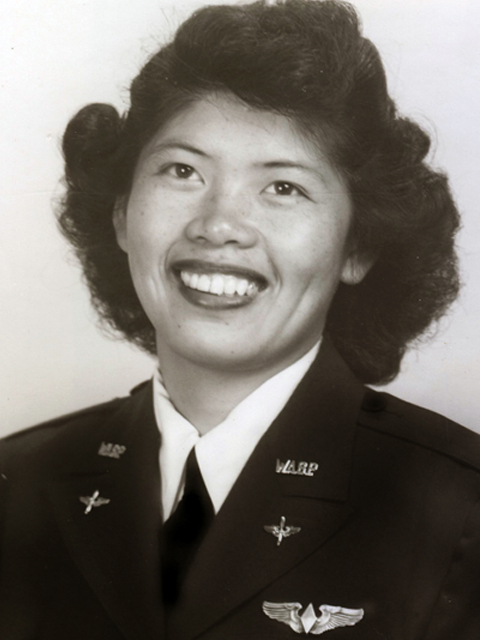 WASP Final Flight: Maggie Gee, 44-W-9, Feb 1, 2013. Maggie Gee, 44-W-9, Feb 1, 2013. "When I was growing up, my heroes were Amelia Earhart and Charles Lindbergh. I loved to watch airplanes fly." Margaret "Maggie" Gee, whose Chinese name was Gee Mei Gue, was born on August 5, 1923 in Berkeley, California, the daughter of a successful Chinese importer and a first generation Chinese-American. Maggie’s grandparents (on her mother's side) had been fishermen who immigrated to the United States to escape the Taiping Revolution and settled in Chinatown, where her parents met and married. However, her father did not want to raise his family in Chinatown, so before Maggie was born, he moved his family to Berkley. When the stock market crashed in 1929, Mr. Gee had a heart attack on a San Francisco street and died shortly thereafter, leaving behind a wife and six children. Maggie’s formative years were spent witnessing her mother take on greater and greater responsibility, not only raising six children and working, but remaining actively involved in her church and her community. When America entered WWII, Maggie passed a drafting test and left her first year of college to work at the Mare Island Naval Shipyards in Vallejo, California. There, she worked as a draftsman for the engineers who were working on classified projects on US Naval ships needing repair. By 1942/43, Maggie had saved enough money to move to Minden, Nevada, to learn to fly. She paid $800 for six months of training and fifty hours of flying time. After she soloed and flew the required hours, Maggie applied for the WASP flying training program at Avenger Field, Texas and was accepted into class 44-W-9. In June, 1944, Maggie left her home in San Francisco and boarded a troop train which was filled with soldiers at Berkley, California. For the next two days, she either sat on her suitcase or stood up -- all the way to Sweetwater, Texas. There 107 women pilots who entered the same class with Maggie; however, only 55 earned their silver wings and graduated as WASP (Women Airforce Service Pilots) on November 8, 1944. After graduation, Maggie was sent to Las Vegas Army Air Field, Nevada, where she served as a tow target pilot for flexible gunnery training for male cadets until the WASP were deactivated on December 20, 1944. She then returned to Berkley and completed her formal education, after which she traveled to Europe and was in charge of a European Service Club in the early 1950's. When Maggie returned to the United States, she began her life as a physicist/researcher, working and studying at the UC Berkley and at its National Laboratory in Livermore. Her research covered the fields of cancer, nuclear weapons design, fusion energy, and other related fields. Maggie's lifetime passion for politics began in the Truman Administration, and she continued her work by supporting voter registration and fundraising, serving on the Berkley Community Fund, the Alameda County Democratic Central Committee, and as a board member of the Berkley Democratic Club in Berkeley,CA. She also served on the California Democratic Party Executive Board and Asian Pacific Islander Democratic Caucus. "I’m very optimistic about the world and people... it will be all right...You can make changes. I think just one small person can make a little bit of change..."
Maggie Gee passed away on Friday, February 1, 2013. She is survived by her nephews: Dale, Dwayne and Gene Chung. A memorial service will be held in Oakland, California -- date to be determined. In lieu of flowers, donations may be made to Planned Parenthood. Maggie's legacy will live on in the lives of all of those she educated and changed with her passionate patriotism and her extraordinary sense of social justice. WASP Betty Turner's "Out of the Blue and Into History"
Rosie the Riveter World War II American Homefront Oral History Project: An Oral History with Maggie Gee conducted by Leah McGarrigle, Robin Li, and Kathryn Stine, 2003, Regional Oral History Office, The Bancroft Library, University of California, Berkeley, 2007. Maggie, thanks for your service to our country. You're an inspiration. Wow, what an amazing woman and an amazing life!